No two plants are the same. Every tree is an individual… And the Olive Tree is more individual than most. This is a tree that gave rise to the development of great civilisations, a tree that whole economies still depend upon, a tree whose branches are internationally recognised as symbols of peace, stability and victory. 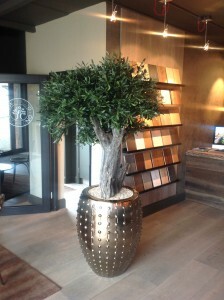 If you are looking for an indoor plant with true character, an office plant with a story to tell, then the Olive Tree will reward you in abundance. Think “olive trees” and you visualise sun-baked hillsides in Greece or Italy or Spain. Not rain-marinated buildings in Ireland. A thriving olive tree loves hours of intense sunlight mixed with dramatic temperature drops. Not window blinds and uniform AC heat. We knew from the start we were taking on a massive challenge but the olive has such unique powers of attraction… We wanted to give our clients the opportunity to put them to use. Mummie Plants are all about looking beyond the run-of-the-mill office plants, seeking out alternative species that can give your business an edgier, more distinctive feel and then preserving them to thrive indoors. The olive tree, though, was having none of it, its leaves resisting all attempts at preservation. But where there’s a will, there’s a way. We started over, from the bottom up. The olive tree’s winding, weathered limbs are perhaps its most distinctive feature, often acclaimed as “living sculpture”. If we could preserve these coveted features then you would get a truly one-off plant with unique natural character. Success – It worked. And so to the canopy. We had to go artificial. But we needed seriously lifelike leaves to match our natural trunk. It required going all the way to the olive tree heartlands of Spain to find them, but find them we did. With the help of our artificial olive leaf experts your tree now peaks in an effervescent crown of darting, silver-green leaves complete with clusters of olive fruits. (We hand-drill the bark and fit the sprays of artificial leaves ourselves here in our Dublin workshop). Place in a suitably stylish planter and there you have it – a zero-maintenance version of an A-List plant world celebrity. To commission a made-to-order tree of your own call Norma on 01 296 4540.